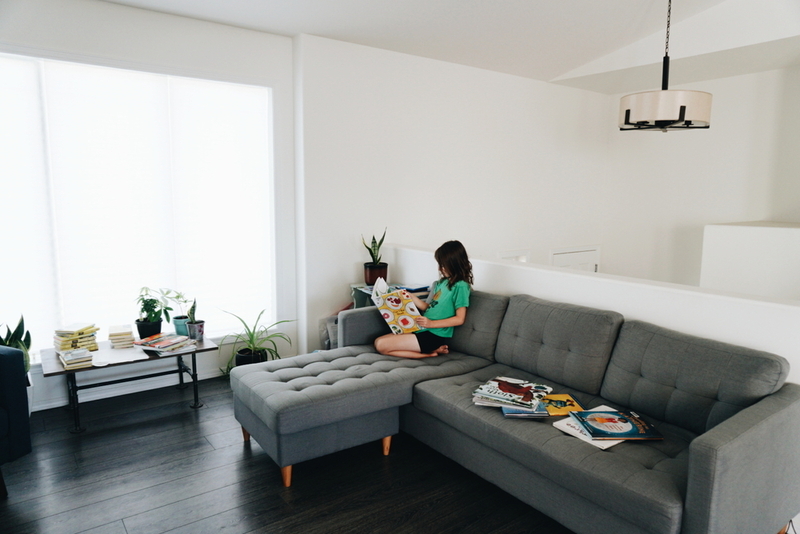 I love that as homeschoolers we have the option to continue homeschooling throughout the summer. Because we live in the Canadian prairies our summers offer some unique learning experiences that we can’t get during the school year (aka winter) here. 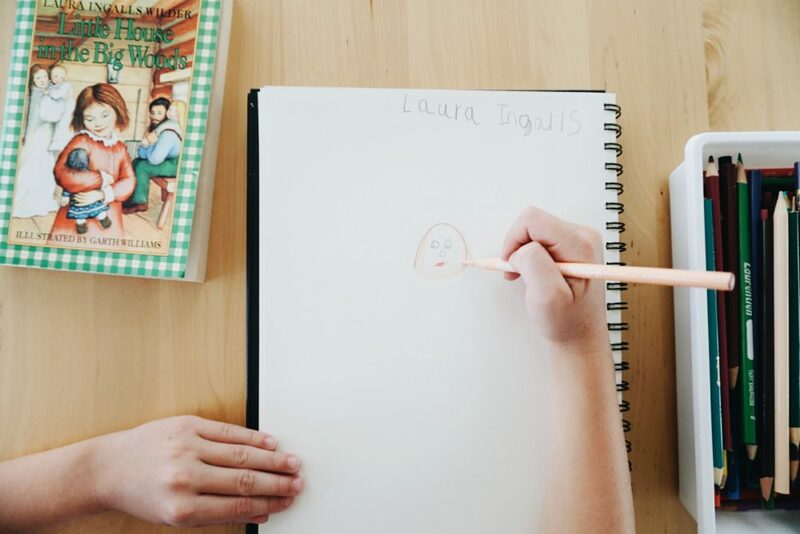 I thought it would be fun for this post to give you a little look inside our homeschool this summer. If you would like to see more detailed peeks into our homeschool either each week or once a month let me know, I’d love to share whatever helps! Because summer is better outdoor weather here we tend to stick fairly close to home in the summer months and then try to get away to somewhere warmer at least once in the winter months. This last year we went to Mexico and for next winter we are hoping Hawaii (if you have any Hawaii tips I would love to hear them!). 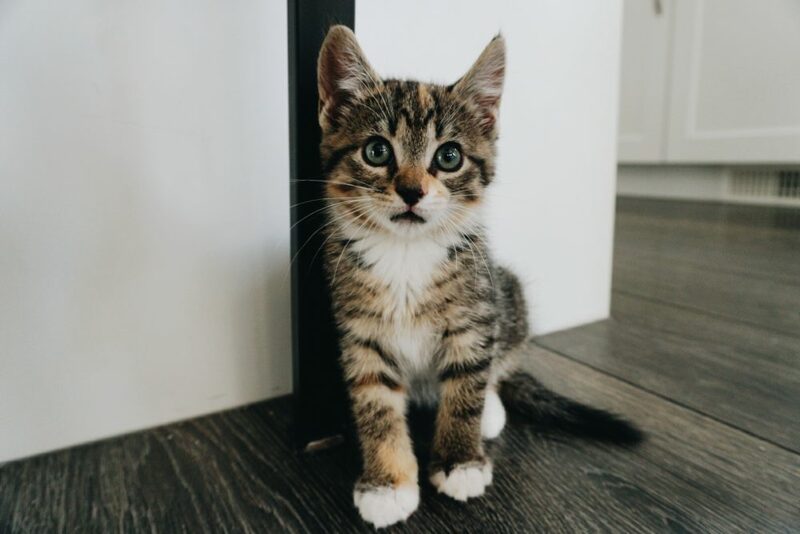 Here’s a big/recent one, we got a kitten! 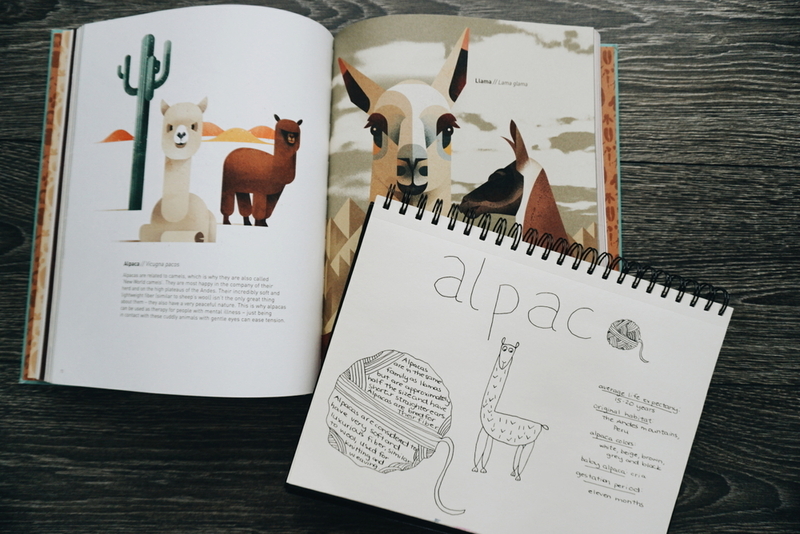 Raeca has been pouring over the cat pages in the Do Unto Animals book, this is such a cute and informative book, we are currently just borrowing it from the library but I have it on my to-purchase list for the fall. This is the first pet the kids have had, Jared and I got a cat shortly after we were married but he was a little aggressive so we found a new home for him before Raeca was born. Ephraim is pretty confident in his pet owner abilities but true to her personality Raeca is a little hesitant. We partly wanted to get a kitten/cat in hopes it would help her with some of her anxieties, time will tell on that. But the kids have been learning some extra responsibilities, like litter box cleaning, I think it’s a good thing for them to learn to have something to look after. Jared has been doing all kids of science experiments and STEM activities with the kids and has a bunch more planned. I’ve really appreciated him taking over that part of homeschooling. 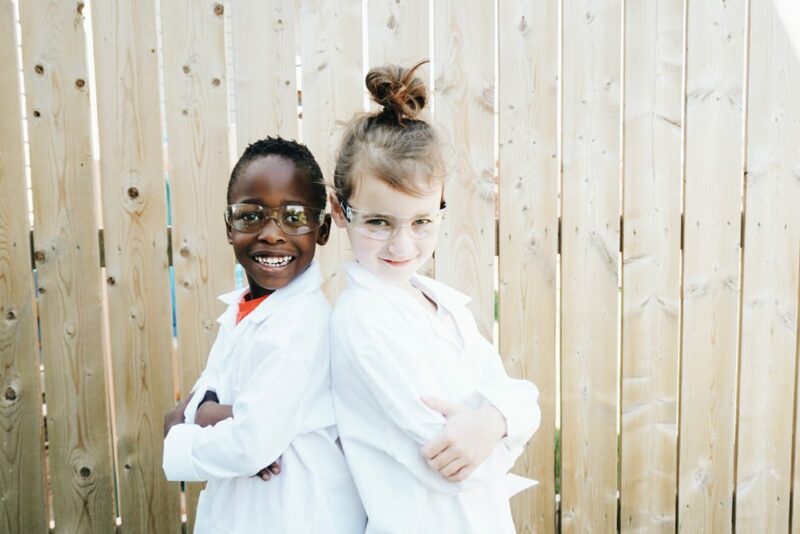 The kids often both say they want to be scientists when they grow up and this is a great way to explore what being a “scientist” could all entail. Ephraim is still working on a lot of fine motor practice, it’s definitely an area he struggles with so I make sure to give him plenty of opportunities to practice. 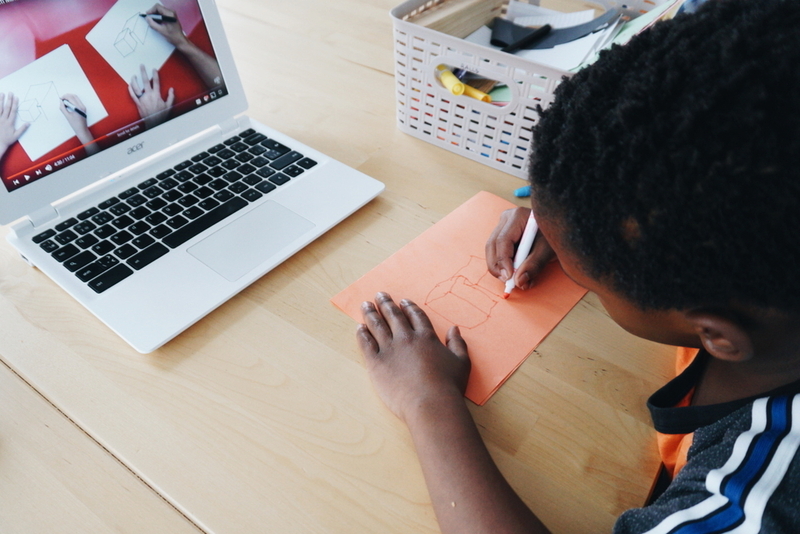 One of my favorite things for him to do is draw birthday cards – it feels like a double win: a birthday card gets made and he practices his drawing and fine motor skills. 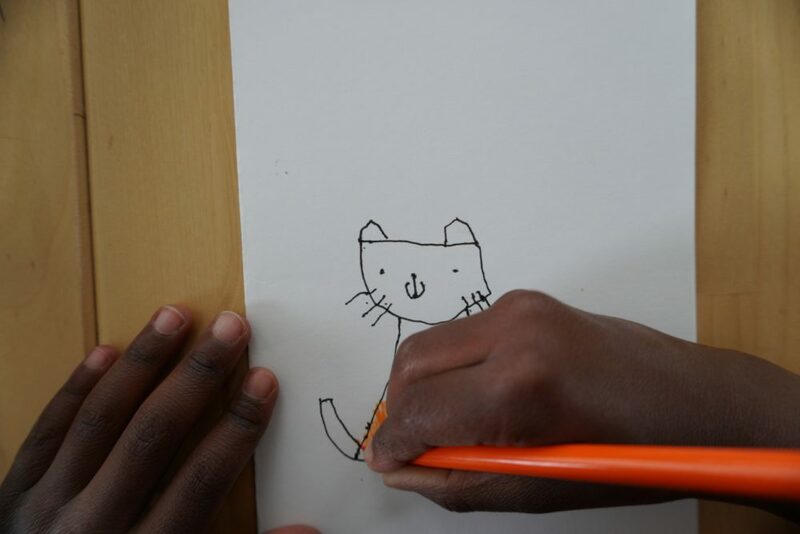 We are doing a variety of other fine motor activities as well, I hope to write a new post about that shortly. All on her own Raeca decided to fill a sketchbook with drawings and small writes up of famous people. I think this will be such a treasure to look back on later. If you have idea for famous people she could include in her book, let me know in the comments, she is looking for more ideas. We enjoy playing games together as a family. I’m not talking about the Monopoly and Sorry you grew up playing but much more interesting games! 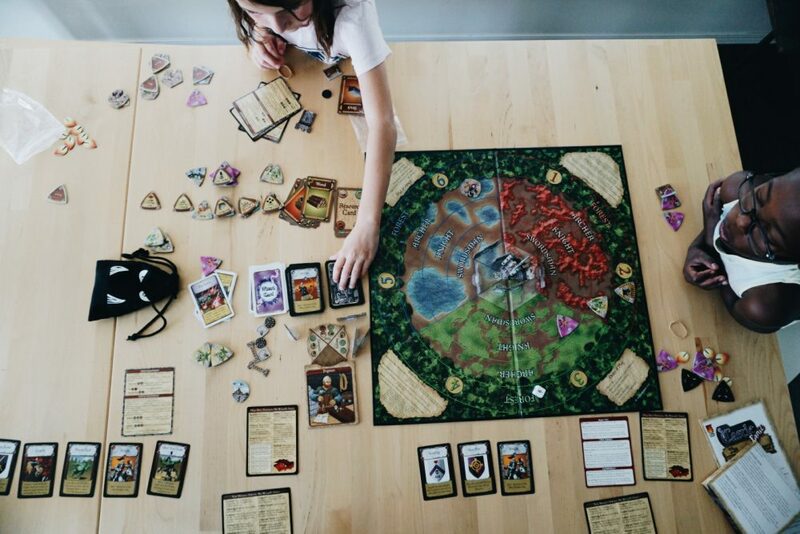 Our family favorite for the last while has been Castle Panic (pictured above) and in the last couple of months we got two expansions for it: Wizard’s Tower and Engines of War, they help to make the game even more interesting and complicated. One of my favorite things about Castle Panic is that it is a cooperative game, so we are all working together to defend our castle. 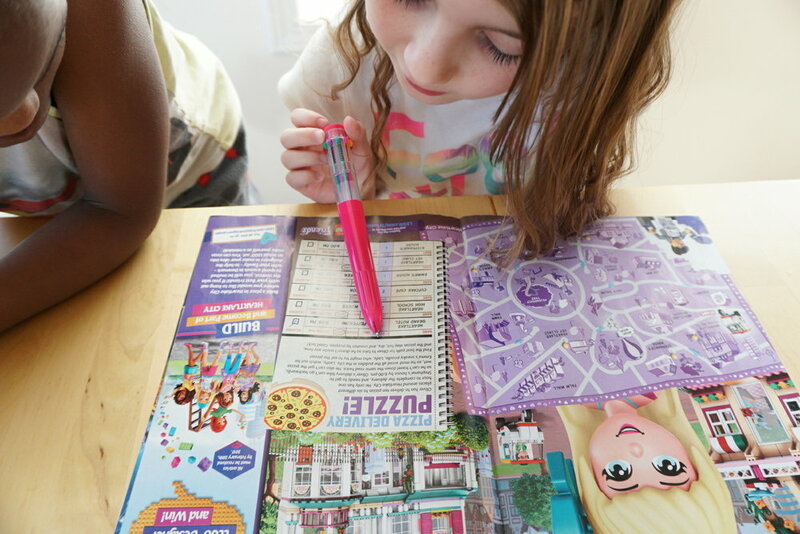 I’ve got a full list of our favorite games that we play here, and yes, even Monopoly is included because despite it being crazy boring to play it works on some great math skills. Raeca and I are trying to use watercolors more this summer. We are learning different techniques and I’m hoping to challenge myself to do some watercolors every day in August. I’m thinking of making this into some kind of Instagram challenge over on my personal Instagram for the month. 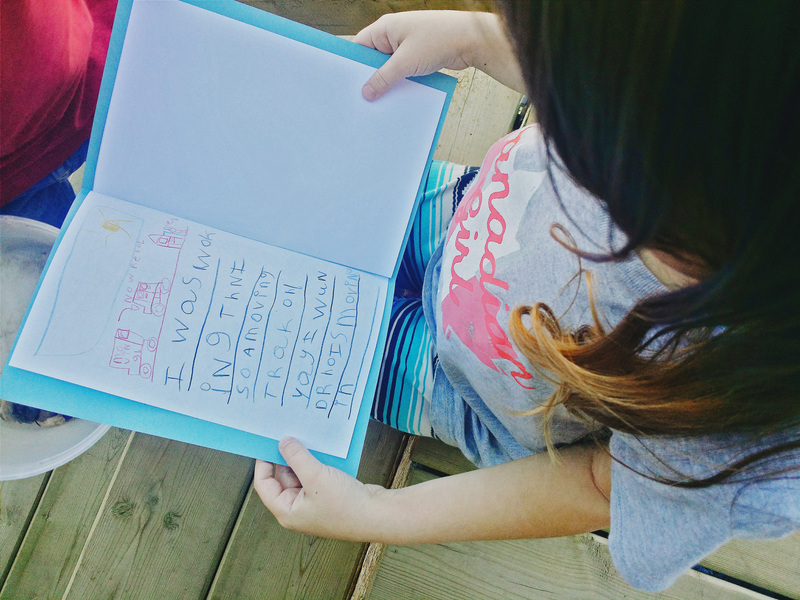 Every week we have been each (the kids and I) been picking a topic to learn about and then are creating what I call relaxing notebooking pages with what we’ve learned. I’m seriously having just as much fun as the kids with this. Ephraim is still working on learning to read, I definitely didn’t want to stop that for the summer and have him loose ground. 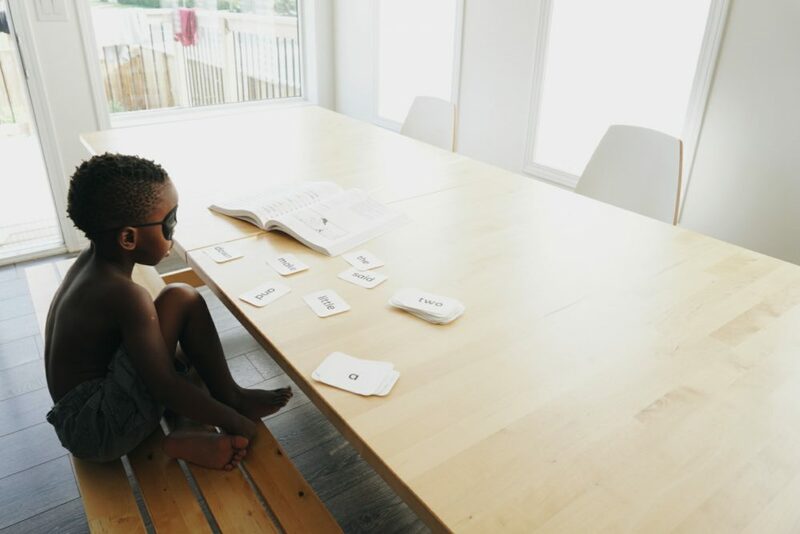 I’ve shared a bit about our method for learning to read before, we take breaks and take it slow but taking the entire summer off would be too much. 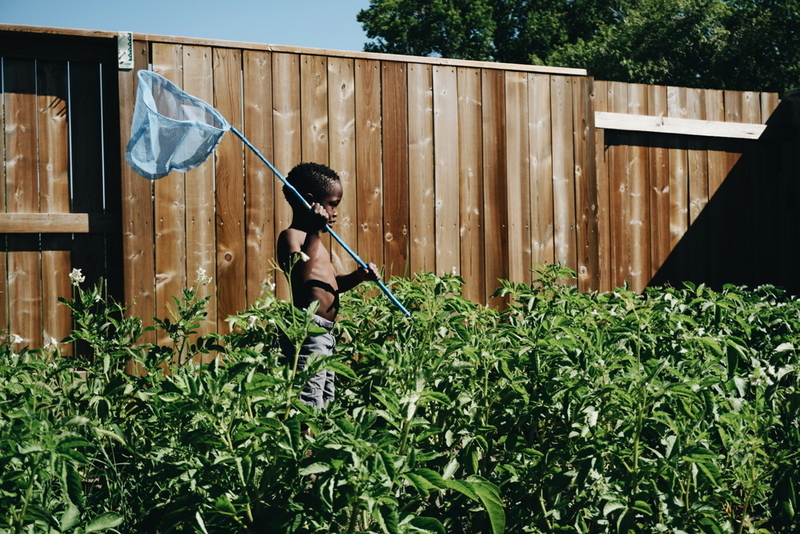 The kids have been so excited to learn about different bugs and nature-y things this summer. Raeca considers herself a pro ant catcher and we watched some videos on how to catch queen ants, the video even told us how to start an ant colony once you do have a queen ant but we haven’t gone that far yet. Our nature study in the winter is much more book based but I love that in the summer we can actually get outside and see the things we are learning about, it makes everything so much more real. Part of living in Saskatchewan means going to the lake in the summer, we have so many lakes here and a lot of people go there every weekend. We used to be more into camping but this year we’ve just decided to make a few day trips. 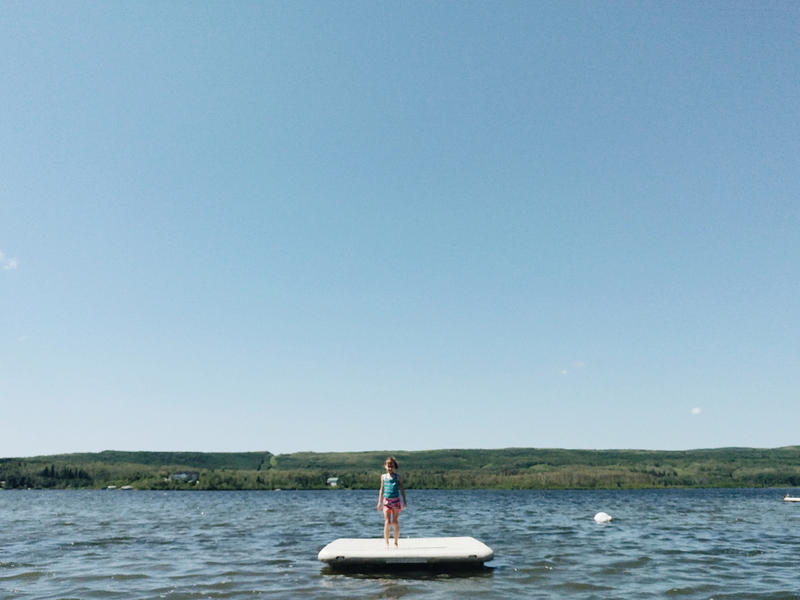 Of course time at the lake means lots of water time, building sandcastles and trying to catch all sorts of creatures (though I’m glad the last time we went to the lake my kids weren’t trying to catch leeches like some others were, I draw the line there). Not everything changes in the summer! We still spend lots of time going to the library and reading a number of books. Normally our library hauls slow down in the summer but this summer they’ve actually picked up because there are just so many good books out there! I shared earlier this year a great list of summer read alouds and audiobooks for kids 7-10. And last, but certainly not least, I always make sure my kids have lots of free time. 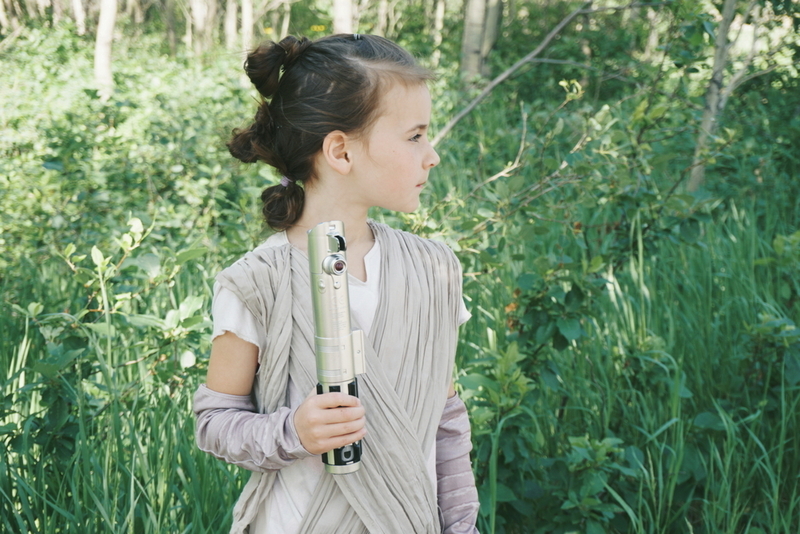 These days that usually means playing Lego or dressing up and pretending they are in some different kind of world. 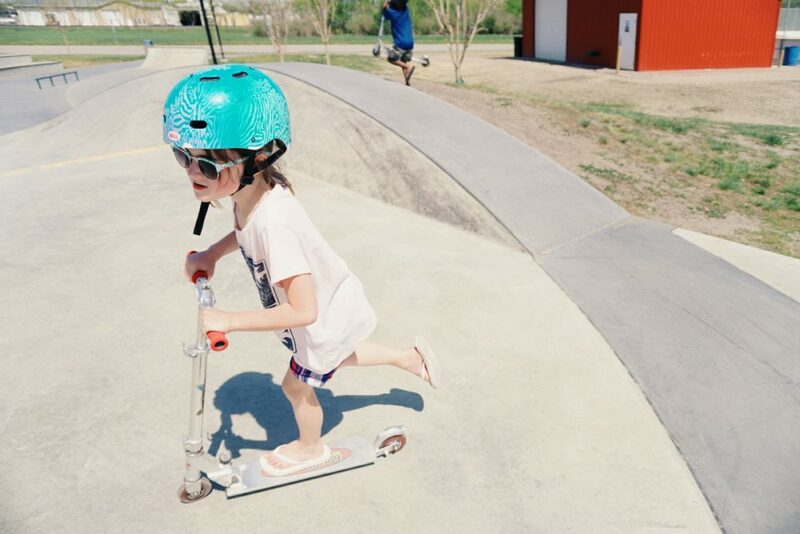 I used to be a skeptic and I have now come to realize how much kids can learn through free play. Okay, your turn! 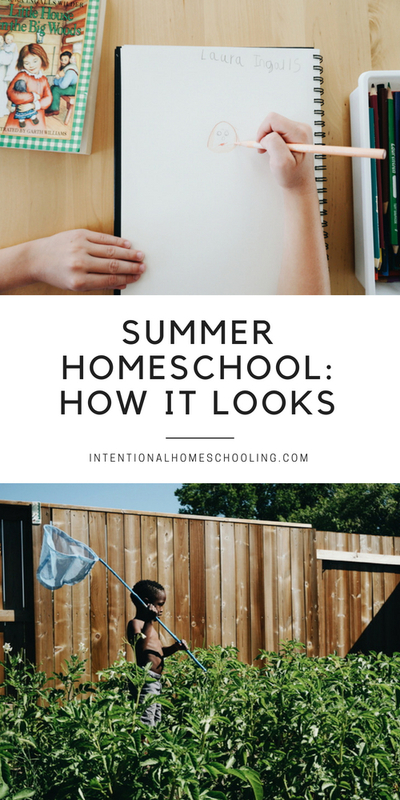 I’d love to hear what your homeschool looks like in the summer, leave me a comment below! Such nice days you must have! DD, my husband and I are also watercolor fans. 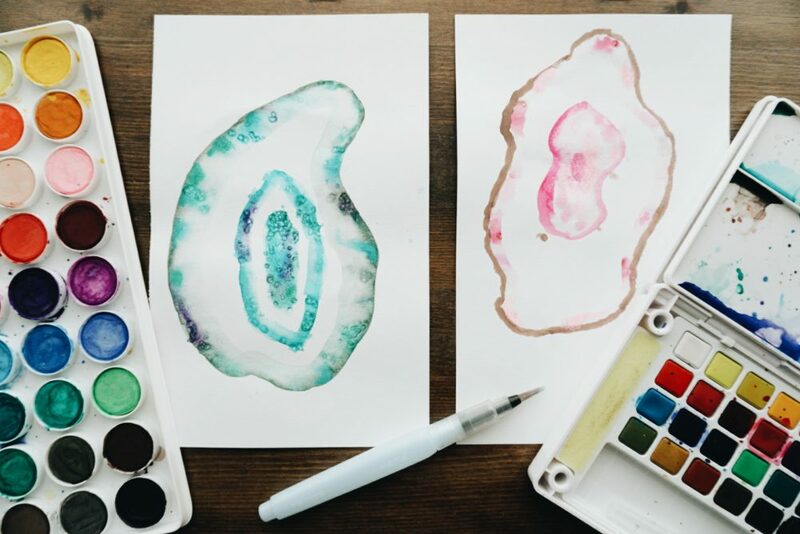 We’d love a watercolor challenge like you mentioned! Sweet! I’ve got some watercolor books coming from the library and I’ll think about how the challenge could look!